Introduction to Arpeggios Hi, I'm Grey and this is Hub Guitar. Arpeggios are one of the basic building blocks of music. But in my private teaching, I have many intermediate and even more advanced players who come to me to learn, and they can almost never play a single arpeggio. How do we play an arpeggio? Technically, when we separate the notes of any chord into individual notes, we're playing an arpeggio. Here's an a minor chord, consisting of the notes A, C and E. [example] In this example, I'm playing A, E, A, C, E... To my ear, what I just played actually still sounds like a chord--although maybe one that has been broken up a little bit. Why? The notes blend together, like a chord. And between the lowest and highest chord tones, there are some missing. The arpeggio would sound much more melodic - like a scale does - if I were to make sure that I include every note of the chord on my way up. This chord has the notes A, C, and E... and I should play all of them on my way up. For example, between the "A" on the 5th string and the "E" on the 4th string, there's a "C" I can play on the 5th string IIIrd fret. Of course this note is not in the chord I used earlier because in chords you can't play two notes on the same string. But in arpeggios you sure can. Also I'm going to make sure each note dies before I play the next note. That creates a more melodic sound. [arpeggio example] Why are arpeggios important? Music is made up of chord progressions. Arpeggios are the notes of a chord packaged in melodic form. So many songs have melodies or other musical parts consisting of arpeggios. Aside from climbing a scale up and down, arpeggios are probably the second most common way for a melody to move. To play an arpeggio, you need to know the names of the notes in the chord that you'd like to arpeggiate. That does normally require a little of bit of understanding of harmony. But it's okay if we compartmentalize our practice and learn arpeggios first without worrying about the theory. We can always look up the name of the chord we want to arpeggiate. Then we need to choose a position. This example is in open position. I recommend for you to start here. Then we will play every note in the chord, from the lowest available, as in this E from the A minor chord, to the highest available in the position. We'll talk more about arpeggios later on. For now, it's enough to just understand what they are and be able to play one. An arpeggioA chord whose notes are played in succession, as if it were part of a melody, as opposed to all together in harmony. is a sequence of notes, played from lowest to highest (as a scaleA sub-set of notes taken from the larger set of 12. The smaller set (usually 5 or 7) is used to build melodies and chords. would be) but the notes themselves are taken from a particular chord. Arpeggios, in addition to chords and scales, form the basic building blocks of all musical sequences. For example, consider the A minor chord. It contains the notes A, C, and E. To play it as a chord, simply form a shape and strum altogether. But how to play this A minor chord as an arpeggio? Simply play the notes one-by-one as opposed to all at once. Although a chord shape can be used to play an arpeggio, note that, on the guitar, arpeggios are not merely chord-shapes played sequentially. Using chord shapes to play arpeggios is not the right way to think of it. 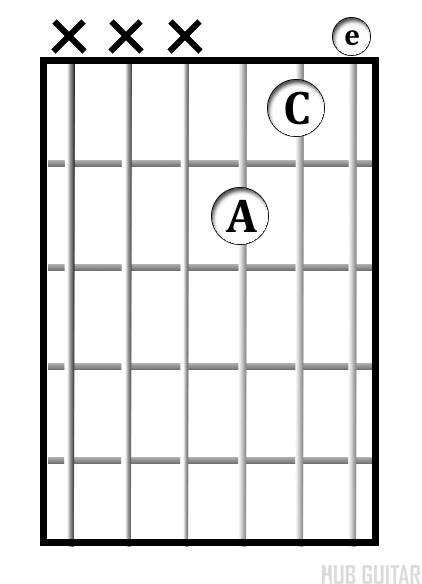 Using the chord shape will tend to result in thinking that is too small: to play a “full” A minor arpeggio in the open position, it should include all of the Amin chord notes available in open position. And those notes should not be allowed to ring together as they would in a chord; each one must fall silent before the next one is played. 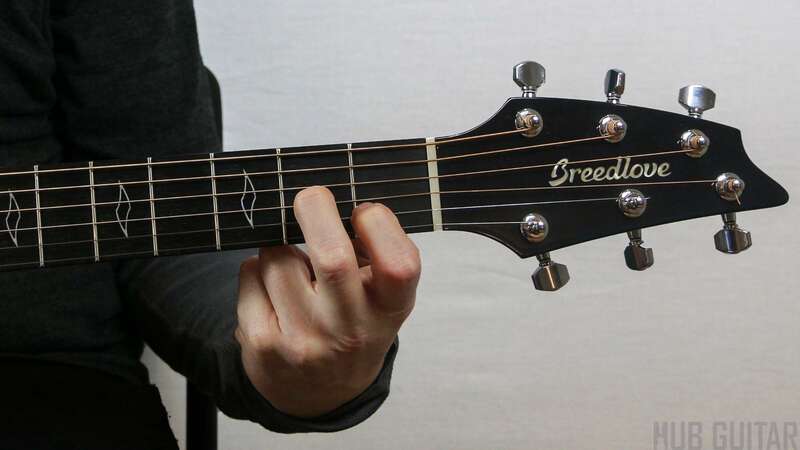 Playing a fuller-sounding arpeggio will require us to start on the lowest chord note available in this position, the open E at the 6th string. Take notice that the notes of this arpeggio are played one at a time, and in succession; it is best not to press and/or play multiple notes at once as you would in a chord. Allowing two or more notes from this pattern to ring together at the same time will start to create the impression of a chord sound (harmonyThe combination of pitches, usually three or more, which results in a chord. ) rather than an arpeggio sound (sequence). Think of another chord, such as C major. Spell the notes and create an arpeggio from that chord.